Jerry Johnson, a New York based business management student and an avid app user installed an app only to discover its inability to interact on any other platform other than the one it was specifically created for. Downloaded at 2.35 p.m. on the 5th of April, 2017 and uninstalled by 3.30 p.m. on the very same afternoon; this is the longevity that a native app has to its credit these days. Native apps are now finding their way back to history, making way for progressive web applications that can cater via any platform. We have witnessed a revolution of a kind with progressive web apps being able to provide seamlessly through mobile devices as compared to their native counterparts. Considering the fact that about 3 to 5 apps are downloaded, experimented and patronized by a mobile user over a period of 30 days, it’s no quantum physics to guess the traffic that a progressive web app could garner while native mobile apps slip into the black spot of technology. With a native app in hand, most businesses have had to incur excessive costs in order to create three different version to be able to support Android, iOS and the web. Progressive web apps play a huge role here with just the expense of a single app that can cater to all of the above mentioned platforms. App installation based friction too is playing its part in pushing native mobile apps away from the tech scene. App store friction is a major hurdle this side. Imagine a 6 step doorway to an app. Most users may simply abandon the idea of downloading the app after step 2. 6 clicks to an app with so many permissions and the innate worry as to how much of space will the app use, can definitely force anybody to drop a native app and go all the way out to a progressive web app. Eric Elliot, a San Francisco based entrepreneur once remarked that native apps lose 20 percent of their users with every click it takes to reach the install button. This is the fact that one must accept that native apps lose out on their potential users even before they click the install button. Another important point of difference that we cannot miss out while comparing a native app and a progressive web app is the user installation process. With a native app, you have to first download the app and then use while with a progressive app, an URL directs you to the app page where you get to use the app. If you are convinced, you get are directed to install the app. Once downloaded, it acts like any other native app. Acquiring users for mobile apps is an expensive affair and most app stores charge a revenue split and that’s when you realize as to why only a few native apps gain the kind of traction it does while the rest are doomed beyond salvage. More than 75 percent of the current traffic in our country comes from mobile apps with about 85 percent of the global market share coming from Android. App friction prevents or rather blocks 75 percent of the potential users and this is fatal. Native apps are a gamble with stats that prove that about 60 percent of the apps hosted on the Google app store have never been downloaded and 80 percent of the users fail to become active users. Native apps aren’t dead as yet and are here to stay for some more while but you cannot deny the fact that even with some inbuilt handicaps that will take its time to improve, progressive web apps are the future of apps. Progressive web apps need to have a foundation to further grow. Considering the fact that the mobile app boom is slowly reducing the fervor with which it had started, every mobile user has already created a comfort app section for themselves with apps like Whatsapp, Facebook and a few more that they feel is all they need to cling to. A survey conducted by a private team has found that about 67 percent of mobile app users in India haven’t downloaded a new app in the year 2016 and the chances are likely that figure might blow up. In the United States, almost half of the smartphone users didn’t install any new app to their comfort. The wind of change has taken its course and these figures definitely prove that with a sufficient reduction in the app boom, the progressive web applications might take their own time to establish itself well. 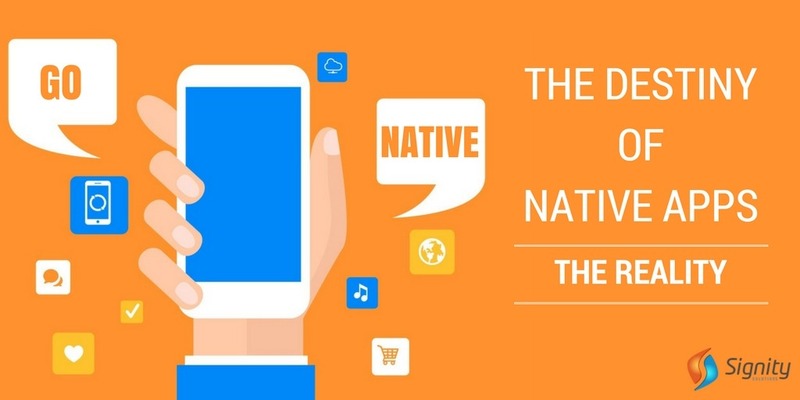 Native mobile app is here to stay yet the web world does realize that its stay here is for a limited while and may not really do a lot to help business organizations garner all that it ought to. Progressive web apps are the future and no matter how long it will take, it’s going to revamp the face of the app experience. Have something more to share? Or simply want to discuss an app idea? At Signity Solutions, our team of experts can help you get the best of both the native and the progressive web apps. Please drop us a line at sales@signitysolutions.com, and having an experience of building more than 350 powerful apps, we are sure to add value to your ideas and answer your queries.